Here’s another innovative product that Mark found at CES 2019. This combination will allow you to easily hold your phone and also mount it in your vehicle. We’re reviewing the iRing and the iRing Dock from AAUXX. The iRing seems similar to the Popsocket, and other phone holders we have reviewed in the past. You stick it on the back of your phone or tablet. It can hold up to 15 pounds. The nice thing about the iRing is that you can use it as a kickstand in horizontal or vertical mode. Sure, you can do that with the Popsocket as well, but the iRing will then hold to your finger, so you can carry your phone around like a ring and not worry about dropping your phone. The iRing rotates 360 degrees and swivels 180. The adhesive on the back can be used many times(iRing claims 100, but we have not tested that). You simply run the adhesive under water when it is dirty, and then reuse. It comes in several colors. You can even get the iRing in Popsicle Orange. The iRing docking system can stick to your dashboard, windshield, wall, or other flat surface. It serves as a stand to hold your phone securely. 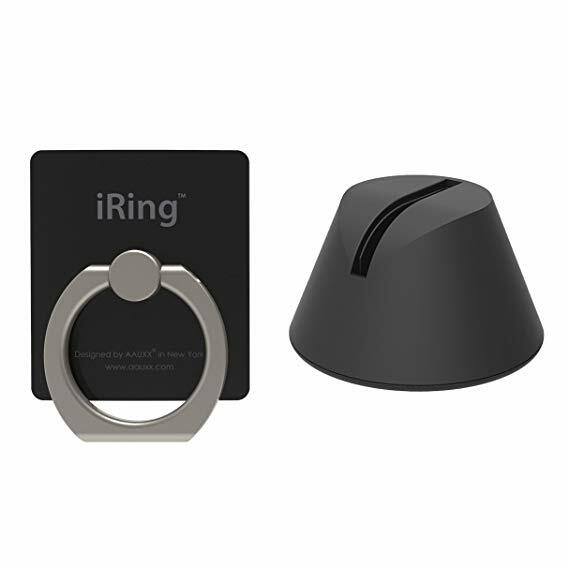 Because of iRing’s swivel and rotating capabilities, you can maneuver your phone in the dock. The 3m adhesive holds the dock to the surface very well. The Prestige set sells on Amazon between $25 and $28– depending on the color you get. We didn’t receive the kit that includes a little hook you can use in addition to the mount, but I found this kit for only $19.95 on Amazon, so that is a good deal as well. Thanks to Aauxx for giving us a review product in exchange for our fair and unbiased opinion. No other compensation has been given.